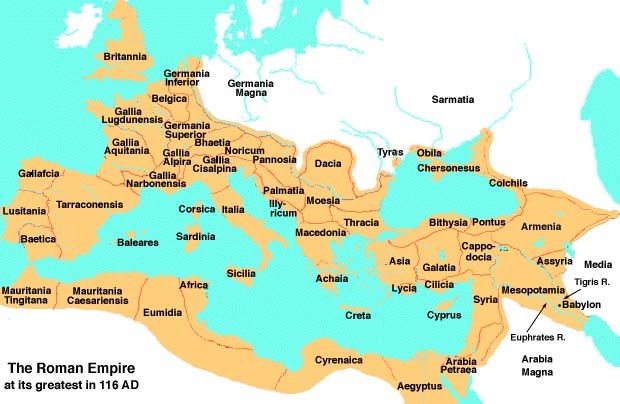 The Roman Empire is one of the most well known and expansive empires in history. Its success was largely driven by their policies and efficient use of propaganda. They were also fascinated with Greek culture, including artifacts, policies, and the spirit of Alexander the Great. The Roman Empire expanded from an earlier Eutruscan culture established on the Italian Peninsula. Many of the images from this early culture demonstrate the shared mythology with that of the Greek peninsula. The Etruscans were a blend of people from many cultures who were connected through trade, language, and common interests. In this lesson, I plan to discuss the rise of the Roman civilization and how this rise affected the technology and formal elements of artifacts from this time. Understand the historical and cultural contexts of Roman and Etruscan civilizations, including the religions of the Roman empire and the Italian Peninsula. Develop a formal understanding of various styles, media, and methods of artistic and architectural production. Understand various art historical themes present within these cultures. The time period discussed spans from the seventh century BCE through the end of the Roman Empire, which was marked in part by the shift to Christianity and the beginning of what became known of as the Holy Roman Empire. There is a lot of information on the historical context from this period as the Romans kept many records that have survived to this day. The story of the Roman Empire began with the settling of the Etruscans in the Italian Peninsula and extended to the rise of Rome as an empire built on politics. The empire eventually ended when Emperor Constantine, who converted the empire's official religion from the pagan Roman mythology to that of Christianity. For specific information regarding the histories of Rome, Fordham University's Ancient History Sourcebook: Rome. Little is officially known of the histories of the early Etruscan civilization. As mentioned before, they were not an unified people; rather they were a group of peoples linked through a similar language found in the area Heroditus refers to as Eutria. They were skilled seafarers, which allowed them to trade with Greece. That interaction shaped their religious mythology and they learned skills that ahsped their architectural and artistic production. Iron, tin, copper, and silver were mined in the area and the styles of Etruscan artifacts parallel the early Greek imagry. Etruscans work tended toward an ostentatious display of wealth and the use of motifs from other civilizations. In 509 BCE, the Romans overthrew Tarsuinius Superbus, the last of Rome's Eutruscan kings. In his place, they established a constitutional government and the new government's power was divided among several governing elements. The majority of the power was placed in the senate, or council of elders. This senate was overseen by two elected consuls. In times of need, the republic could appoint a dictator for a limited time and specific purpose. This practice reflected their belief that a single vision during such times could be beneficial. This dictator would command the army during such crises. The civilization itself was separated into various casts. The highest ranking members of society were male wealthy landowners or "patricians." Smaller farmers, merchants, and freed slaves made up the plebeian class, and below them ranked slaves who mainly consisted of conquered peoples, though slaves often had the option of buying their freedom and thus, generationally, move up in society. The Roman Empire built itself on those that claimed their descendants from the brothers Romulus and Remus, who were raised on the seven hills of Rome by a Shewolf. Romulus eventually killed Remus to become the sole leader of the area. These descendants later conquered the rest of the Eutruscans, the Gauls, Samnites, the Greek colonists, and eventually the Carthaginians of North Africa. By 211 BCE, the early leaders had conquered much of the lands surrounding the Mediterranian. Under a republic, the senate and elected leaders maintained the power of the empire. The end of the Roman republic is marked by the death of Julius Caesar, who, after being nominated dictator, claimed himself to be dictator for life, an act that angered the senate who assassinated the general on the Ides of March, 44 BCE. The empire quickly plunged into a civil war that lasted until 31 BCE when Octavian, Caesar's grandnephew and adopted son, defeated Mark Antony and Queen Cleopatra and officially absorbed Egypt into the Roman Empire. The transition from Republic to Early Empire occurred in 27 BCE, when the senate confired on Octavian the title of Augustus, meaning "majestic" or "exhaled one." Though the Roman law and political organization of the senate remained, Augustus Octavian was recognized as holding the power of all the key positions: princepts (first citizen), council and imperator (commander in chief), and, after 12 BCE, pontifex maximus (chief priest of the state religion). Augustus Octavian thus had control over all aspects of life, the political management, the army, and the religion. Under the control of the powerful armies led by Augustus, this transition led to a period known as the Pax Romana (Roman Peace), or in his day, Pax Augusta (Augustan Peace). With powerful armies holding the borders of the empire, the majority of the empire was left to prosper, allowing for commissions of many public works on an unprecedented scale. Many of the works from this time, especially the images of Augustus Octavian before he took power and throughout his reign, demonstrate the effective use of propagandistic imagery to demonstrate the power and control of those in power. In the second century CE, under Trajan, Hadrian, and the Antonines, the empire reached its greatest geographic extent, spanning several continents. This era of the empire demonstrates the height of the Pax Romana as, although there were pressures from the Germanic peoples in Europe, the Berbers in Africa, and the Persians from the East, the empire flourished. The late empire is marked by the assassination of Marcus Aurelius's son Commodus in 192 CE, which brought the Antonine dynasty of rulers to an end. By this time, the constant pressures on all borders from other military had drained many resources and the economy was in decline. The religion was loosing ground to many of the Eastern cults, the religions of many conquered peoples. Among these cults was the beginnings of the Christian faith, a faith that was practiced mainly in secret as many early Christians were persecuted for their beliefs, often thrown to the coliseum for spectacle. The Late Empire, however, demonstrates the slow transition from the Roman pagan faith toward the growing Christian population. Politically, there was also much turmoil with the assassination of Commodus. Septimius Serverus established a new dynasty that rulled the empire for nearly half a century ending with the murder of Serverus Alexander leading to a seemingly endless civil war as many generals came with their armies to lay claim to the empire. The strife lasted until 293 when emperor Diocletian decided that the most prudent method for maintaining power and restoring peace would be to split the empire between the remaining claimants. He thus claimed the title of Augustus of the East and divided the empire into four sections. The other three tetrarchs were labelled Augustus of the West and the remaining two became the Caesars who remained aligned to the two Augusti through marriage. This peace lasted only a short time until the retirement of Diocletian, when the two halves of the empire became forever split between the Roman East and the Byzantine West. In 312, Constantine I, son of Constantius Chlorus (Diocletians Caesar of the West) defeated Maxentius and took control of Rome. He attributed his victory to the aid of the Christian God. The following year, Constantine's co-emperor in the East, Licinius, and himself issued the Edict of Milan ending persecution of the Christians. The relationship between Constantine I and Licinius quickly eroded and Constantine I eventually defeated Licinius, executing him near Byzantium (modern day Istanbul, Turkey). He thus founded a "New Rome" at Byzantium and named it Constantinople (City of Constantine) in 325. Christianity became the official religion of this New Rome and the ancient pagan cults began to dwindle in popularity. In 337, Constantine was baptised on his deathbed and the transition from the pagan gods to the recognition of Christianity marks the shift from the Roman Empire to the Holy Roman Empire and the beginning of what is now considered the Middle Ages. Rome: Rise and fall of an empire: a video series, each 45 minutes long, that describes in detail the history of the Roman empire. In this section, we will discuss more of the specific stylistic elements that shape the artifacts from various periods of the Roman civilization. The Etruscans were a grouping of peoples with a common language, but eclectic personalities. Many of the artifacts from this time reflect a fascination with Greek culture and an orientalizing style. The Etruscans didn't simply copy, though; rather, they adapted Greek styles and practices to meet their tastes. Etruscan temples tended to be raised with a specific front entrance extended by a columned portico. Statues were often found on the roof, rather than in the pediment. The sculptures very much resembled archaic Greek sculpture in the modelling of cloth and the representation of facial features. Sarcophogi also found a tradition in reclining figures, often couples on a bed. Etruscans were also known for their tumuli which were necropolis structures. They created these tombs as mound-like structures and also rock-cut structures that demonstrate amazing understanding to architectural construction and sculpted detail. 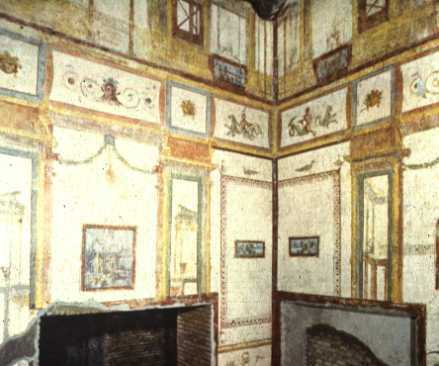 Etruscan paintings have also been found that show a similar style to Minoan frescos described in Greece. They show landscapes, scenes of athletic pursuit, and scenes of festivity. The lively colors work to bring interest to the often stark walls, especially in some of the tomb structures that have been excavated. Etruscan: From Smarthistory.org. Be sure to also browse the "Temple of Minerva" and the "Sarcophagus of the Spouses" links to the left and further reading to the right. The early artifacts from Roman culture show a love of Greek art. As the empire expanded and spoils from war were brought back to Rome, the exposure to Greek sculpture and painting influenced Roman work, as was the case when the archaic Greek sculpture influenced earlier Etruscans. The Romans were known to take bronze Greek original works and, using skilled labor, endlessly reproduce the sculptures in marble. Original Roman artwork, however, merges stylistic traditions of the Etruscans and the Greeks. The Romans were able to develop wondrous monuments, temples, and other structures quickly and with much less expense due to their invention of concrete construction. The Romans produced a specific form of concrete that was extremely hard and they were able to produce shapes that allowed for further architectural inventions such as the barrel vault, groin vault and hemispherical domes. Sculpted and painted portraits, unlike the kouros and kore of the Greeks, often were idealized, but maintained much of the realism of the person that they represented. This tradition of verism required that artists produce portraits that were more accurate to the sitter as they wished to be remembered for exactly who they were, with all of their faults. Idealized portraits were also produced for political gain. Portraits were extremely popular also due to the democratic structure of the civilization, since people wished to be individually known for their accomplishments. In Pompeii and Herculanim, cities covered for thousands of years by the ash cast onto them by the eruption of mount Vesuvius, tell us much about the various artistic styles for both art and architecture of ancient Rome. The ash was able to conserve much of the architecture, paintings, and even the people in the last moments of their lives. The paintings represent various styles aptly labelled: First Style or Monarchy Style, Second Style, Third Style, and Fourth Style. First Style: paintings demonstrate a masonry style, imitating marble panels and painted in stucco relief. They were based on a typically Greek style of decorating similar to faux finishes we find today. Second Style: are paintings found after 80 BCE, where the artists sought to dissolve the walls and replace them with illusions of the three dimensional world, often referred to in contemporary art as tromp le'oil. This tradition is similar to many of the paintings that were found in Etruscan tombs. Third Style: paintings are typically of a delicate linear fantasy placed on monochromatic backgrounds. They do not attempt to open the wall or demonstrate faux finishes. Often they are paintings of small landscapes within a framed panel that increases the space slightly, but without the effects of the second style. Fourth Style: is a style that became popular around 62 CE through the end of Pompeii. This style often combined elements of the previous three. Early Empire styles were shaped by the constant expansion that took place under Augustus Octavian and his successors. The stylistic compositions of the Etruscans persist, however the modelling of form more closely resembles classical Greek sculpture and architecture. As the empire expands, urban projects such as aqueducts were necessary to bring water to the growing cities. Triumphal arches also became a popular method for commemorating roads and displaying information about such dedications much like large billboards. Kleiner's Lecture on Trajan's Forum: I recommend this series of lectures if you want in-depth lectures on the time and art. Bigger is Better: Kleiner Lecture on the Baths of Carcalla and other Second- and Third-century architecture. Art and architecture created throughout the Roman Empire demonstrate the power this culture had to absorb and adapt the knowledge of those that they conquered and, with it, to produce awe-inspiring technological feats. In architecture, the Romans developed concrete and were able to produce structures never seen before on the scale that they would produce. There is evidence of barel vaults, arches, groin vaults, and the largest known ancient dome found in the Pantheon. Romans produced aqueducts, roads, and triumphal arches also on a massive scale. The technological achievements of this culture can be found in every aspect of their society. Propagandistic imagery is also found throughout the culture. The Romans were a society based on the possibility of upward mobility. As such, it was always necessary to develop images that could sway public support and allow for advancement. The image of Augustus from Primiaporta is a great example of such propagandistic imagery along with the Ara Pacis. Future rulers took note of many of the methods that Augustus undertook to sway the populous during civil war. More on this can be found in your Module 3 reading. Religion is an interesting theme to consider when looking through Roman art. We see a transition from the early Etruscan pagan beliefs that mimic Greek mythology toward the more formalized Roman mythology. This pagan culture lasted for many years, but as Christian cults began to pull in followers, there is a noticeable transition toward Christian imagery and themes.